Lenin once said that Bernard Shaw was a good man fallen among the Fabians – a group of wishy-washy left-wingers whose airy-fairy politics was neither in capitalism nor in any kind of scientific socialism. It was, at best, a shade of state welfarism within the capitalist framework. Prof. Laksiri Fernando (LF) is of the same ilk. I am not referring to his Trotskyite past when he was at Peradeniya University. I am referring to his current anti-Sinhala-Buddhist politics. He, of course, says that his intellectual affinities are with Buddhist philosophy. His objections, as I understand it, are to Sinhala-Buddhist politics which oppose the disproportionate demands manufactured in the thirties and forties by the two intransigent racist gang-leaders, Ponnambalam and Chelvanayakam. The Sinhala-Buddhists, I am sure he will concede, have managed to resolve their differences to a great extent with the other two minorities, the Muslims and the Indian Tamils without resorting to excessive and intransigent violence. The main problem has been only with the rabid racists of the North who have been insisting relentlessly on their pound of flesh, irrespective of the consequences to the others. It is their bovine obstinacy that has militated against any peaceful co-existence with other communities. Their position is that peace can be achieved only on their terms. This is the fundamental flaw in any peace-making process, or reconciliation. The Tamil political leaders have a consistent history of either rejecting the many offers given to them as solutions to their demands, even with international guarantees, or kept on expanding the political goal posts for them to kick as many goals as the want without any restrictions. This is what LF, , refuses to see. He and others of his ilk think that they are the avant-garde of progressive and lofty thinking when in reality they are sinking in the rubbish dug up initially by Ponnambalam in the thirties and left for Tambiahs, Seneviratnes and Fernandos. In this article, I shall deal only with his fanciful notion of the Sangha running a state within state. Out of the blue he suddenly, sees the Sangha running a state within state. The Sangha is doing what it has been doing throughout its history and for him not to have noticed this, he must have migrated, not to Sydney but to a planet near the black hole in the centre of the Milky Way. However, as a political scientist he has an ethical and academic duty to rise above his anti-Sinhala-Buddhist politics and consider the consequences left behind by the non-Sangha activists who have intervened aggressively in obstructing and even reversing state policies. These interventionists have wielded more power in the state than the Sangha and I have not heard a peep coming out of him questioning their unwanted and destructive roles. I shall select only three instances to test the validity of his argument: Case 1: When the anti-conversion bill was presented the American government of Bush, a committed Evangelist, forced his will on Chandrika Bandaranaike’s government to reject it. Now which state was running CBK’s state? Case 2: Whenever the Muslims feels that they are threatened they round up all the diplomats of Muslim states stationed in Colombo and exert maximum pressure on the Sri Lankan state to rein in. Now, can Prof. Fernando name the outsiders who are stepping in to run the Sri Lankan state? Here I’m not being judgmental on the Muslims and their political reactions. I’m only focussing on the role of other states interfering in the domestic affairs of Sri Lanka – something which they would resent and even retaliate against if it happens to them. Case 3: Worst of all, according to the Maha Sangha the NGOs are physically present at government proceedings influencing/directing policy on constitutional changes. No one has heard a whimper from Fernando on this intervention by hired agents of foreign powers using NGO apparatchiks as “the soft power” to push their foreign policies. But, he has come out firing on all four cylinders against the Sangha, the traditional guardians of the nation who have sacrificed their lives at times, to serve the people. Of the two who has the legitimate right, to intervene on a critical issue like the making of constitution? If, as pointed above, foreigners and agents of foreigners are given the silent nod by Fernando why is it wrong for the Sangha to do their bit in opposing foreigners with their anti-national and anti-Sinhala-Buddhist agenda? He is contesting the legitimacy of the Sangha which laid the foundations for this nation. The Sangha also can be considered as a vital part of the home grown civil society unlike the foreign-funded NGOs who represent foreign governments. If the Sangha can’t raise their voices in critical national affairs who else can? But the overwhelming trend in the post-Ponnambalam /Chelvanayakam period has been to delegitimise the Sangha on the spurious argument that their place is in the caves. The entire political thrust of these scientists and historians is aimed relentlessly at debilitating – and if possible eliminating — the power of the Sangha and strengthening the power of the anti-national forces as a means of imposing their political agenda on the nation. 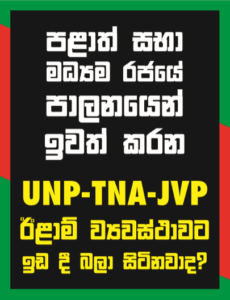 This line of action is pursued on the bogus assumption that it is the anti-Sinhala-Buddhist NGOs, academics, diplomats, paid hacks of the UN, and other interventionists who have the answer to the issues threatening national security, peace and prosperity. The Sangha is very clear in its mission. The Sangha says categorically that it opposes the militant rhetoric and activities of the Bodu Bala Sena (BBS). But, it is urging the government to look into the grievances expressed by the BBS. It has also expressed opposition to the current moves of the government to change the constitution which seems to be a Sisyphean process: each time the constitution is rolled up the mountain to the top it comes down and the constitution-makers have to do it all over again. This futile process is done not because the people are yearning for new constitutions as if it is some dirty underwear which needs changing every day but to satisfy the insatiable political appetites of those who pursue the goal of breaking up the nation. The argument for and against this political ambition has been tireless and inexhaustible. But I would like to ask Fernando one question : can he name one significant solution that has been worked out by the NGO pundits and their likes for the national crisis since the Tamil leadership declared war against the nation at Batakotte (Vadukoddai) in 1976? Where has their interventions led the nation, except, of course, to Nandikadal? Every peace-maker providing solutions – Rajiv Gandhi, President Premadasa, Neelan Tiruchelvam, etc – was killed. The more they killed the more the NGO, INGOs and other academic and foreign interventionists clamoured for more concessions. Most of those concessions were given with international guarantees because the “Sinhala governments” were said to be unreliable. What happened? All their bogus theories sank in the murky waters of Nandikadal.